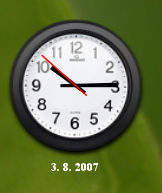 Posted on August 3, 2007 under Linux. Sometime back I was hunting for a How To on installing gDesklets on openSUSE. For the uninitiated, gDesklets is a widget program for Linux that let’s you run small applications on your desktop. It’s similar to Dashboard for Mac and Gadgets for Vista. In short, it adds eye candy to your Linux desktop :-). First up, you need to fetch the RPM for the gDesklet package. I found the package in Guru’s RPM repository. For information on how to add a repository and on how to add Guru’s RPM repository you can refer to the official openSUSE site. Once the package is installed, you can find the gDesklet application under Utilities. Next, you would need to get some widgets. Head over to the official site for some of the more stable widgets or if you are comfortable with you can try your luck at the unofficial widget repository. Once you have downloaded a widget you can install it through the widget manager. You can access the widget manager by right clicking on the system tray icon and choosing manage widgets. After this installing is as simple as using the File -> Install Package option and navigating to place where you downloaded the widget package. Running the widget is again accomplished by the File menu. Once a widget is running, you can position it by dragging it around on the desktop. To move a desklet, right click on it and choose the Move Desklet option. Most desklets can be similarly configured through the Configure Desklet option. With this you should be up and running with geDesklets on openSUSE 10.2. Hope this post is helpful for those wanting to get gDesklets working with openSUSE. This entry was tagged under: how to, openSuse, Products, Software. Both comments and pings are currently closed.